Bush BFSAT01HD review | What Hi-Fi? Although pretty much the same as the Grundig GUFSAT01HD and Goodmans GFSAT200HD models, this Bush has one extra differentiating feature over its brothers – it's £30 cheaper (oh, and its remote has silver buttons instead of grey). It must be that Alba – the parent company to all three brands – feels the Bush name holds slightly less value than that of Grundig and Goodmans, as in terms of spec and performance, they're identical. This Freesat box offers an extremely clean and stable picture from any broadcast, and HD channels are really lovely. However, there is a degree of softness to SD pictures, and some missing weight to audio performance. The Bush shares the same somewhat ugly and underwhelming menu system and EPG as its stable-mates, and setup was similarly hit and miss. Considering this is the same as the Grundig and Goodmans but for less money, you may wonder why it doesn't score higher than its siblings? The truth is that although saving £30 is great, we don't think the Bush box is quite giving us the full Freesat potential. 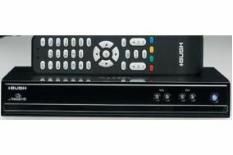 The overall slight softness to standard-definition broadcasts and lack of sonic weight are things we expect to be improved upon with future models, both from this manufacturer and others. So although we'd certainly take the Bush over the Grundig and Goodmans models, we don't think it's worth five stars. If you fancy getting yourself the cheapest Freesat HD box on the market, you'd best head down to Argos, as at the time of writing, that's the exclusive retailer of this Bush model.